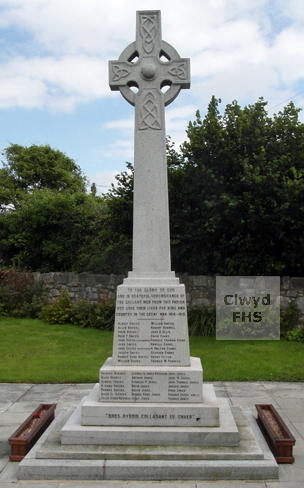 The Abergele War Memorial commemorates those men of the area who died during World War I and World War II. The memorial, in the form of a stone, standing Celtic Cross featuring Celtic knotwork, stands in the grounds of St. Michael's Parish Church. It was dedicated on 7 Jul 1921. Abergele is a town in the County Borough of Conwy. Until 1974 the area was part of historic Denbighshire, and between 1974 and 1996 of the county of Clwyd. (5th Bn.) 26 Sep 1917 21 Son of Robert & Anne Davies, of 15, Plasnewydd Buildings, Abergele. Jerusalem Memorial, Israel. (1st Bn.) 30 Oct 1914 22 Son of John and Alice Davies, of 1, Fron Hyfryd, Groes Lwyd, Abergele, Denbighshire. Born at Birkenhead. Also named on the Rhyl War Memorial Hooge Crater Cemetery, West-Vlaanderen, Belgium. (1st Bn.) 29 Dec 1914 32 Son of Hugh & Annie Davies, of 1, Nelson Terrace, Abergele; husband of Ethel Annie Davies, of 11, Stanmore Street, Rhyl. Ploegstreert Memorial, Hainaut, Belgium. (10th Bn.) 26 Feb 1916 21 Son of John & Matilda Davies, of 15, Mount Pleasant, Abergele. Lijssenthoek Military Cemetery, West-Vlaanderen, Belgium. Cheshire Regiment 15 Mar 1918 30 Son of David & Laura Davies, of Bryn Coch, Abergele. Erquinghem-Lys Churchyard Extension, Nord, France. (1st Bn.) 16 May 1915 27 Son of Walter and Alice Davies, of 5, Rhuddlan Road, Abergele, Denbighshire. Also named on the Rhyl War Memorial. Le Touret Memorial, Pas de Calais, France. 21352 Prince of Wales' Volunteers (11th Bn. South Lancashire Regiment) 1 Jul 1916 36 Born Abergele. Husband of Myfanwy Davies, of 48, Tennyson Street, Sutton Manor, St. Helens, Lancashire, England. Thiepval Memorial, Somme, France. (30th Sqdn.) 4 Jan 1917 30 Son of William Williams Dicken & Ellen Dicken, of Beach House, Llanddulas. St. Cynbryd's Churchyard, Llanddulas. (4th Bn.) 17 Jul 1918 22 Born Otley, Yorkshire, England. Son of Christopher & Elizabeth Dunwell, 7, New Street, Abergele. Basra Memorial, Iraq. (5th Bn.) 26 Mar 1917 38 Son of Mr. and Mrs. Ellis, of Bodelwyddan, Rhyl; husband of Mrs. M. A. Ellis, of Pontydd, Towyn, Abergele, Denbighshire. Also named on the Towyn War Memorial Jerusalem Memorial, Israel. (4th Bn.) 25 Sep 1916 23 Son of the Rev. & Mrs. Graham Evans, of Duntrune, Abergele. Also commemorated on the St. George War Memorial and the Llanrhaeadr War Memorial. St. George Churchyard. King's Liverpool Regt. 3 Sep 1918 Son of David Roberts Evans & Hannah Evans, Bank Building, Abergele. Glageon Communal Cemetery Extension, Nord, France. 1817 3rd Salvage Coy. Australian Army Service Corps. 16 Jul 1918 43 Son of David and Annie Evans, The Vicarage, Abergele. Brother of David Saxon Walton Evans (see above). La Neuville British Cemetery, Corbie, Somme, France. (10th Bn.) 8 Apr 1917 30 Son of David and Elizabeth Evans, of 21, New St., Abergele, Denbighshire. Also named on the Llandudno War Memorial. Arras Memorial, Pas de Calais, France. (19th Bn.) 23 Nov 1917 35 Born in Heaton Norris, Stockport, Cheshire, England. Son of Jemima Sophie Needham of Brynffynnon Cottages, Abergele. Cambrai Memorial, Louverval, Nord, France. (5th Bn.) 10 Aug 1915 25 Born Llandulas. Son of Thomas & Sarah Ann Furnish, of 8, New York Terrace, Abergele. Helles Memorial, Turkey. ("D" Coy. 16th Bn.) 11 Apr 1916 28 Son of John & Hannah Hughes, of TÅ· Ucha, Abergele. Bethune Town Cemetery, Pas de Calais, France. (15th Bn.) 10 Jul 1916 30 Son of the late Elias Hughes, of 4, Mount Pleasant, Abergele. Thiepval Memorial, Somme, France. (4th Bn.) 6 Aug 1915 21 Helles Memorial, Turkey. (4th Bn.) 6 Apr 1918 40 Son of John & Mary Hughes, of 'Bodgwynedd', Abergele; husband of Maria Hughes, of Chapel Street, Abergele. Martinsart British Cemetery, Somme, France. (17th Bn.) 30 Jul 1916 21 Son of Charles & Mary Jane Jones, Metropole, Abergele. Thiepval Memorial, Somme, France. (11th Bn.) 18 Sep 1918 30 Son of Elizabeth Jones, of 10, Bryn Tirion Terrace, Abergele, & the late David Jones. Doiran Military Cemetery, Greece. (17th Bn.) 12 Oct 1916 18 Son of William Henry & Martha Jones, Penybont, Abergele. Thiepval Memorial, Somme, France. (1st Bn.) 3 Sep 1916 Son of John & Ann Jones, of 12, Mount Pleasant, Abergele. Thiepval Memorial, Somme, France. (2nd Bn.) 31 Oct 1914 Born Abergele. Bailleul Communal Cemetery, Nord, France. (2nd Bn.) 21 Oct 1916 21 Son of Robert Jones, of 15, New Street, Abergele. Thiepval Memorial, Somme, France. 64619 Cheshire Regiment (11th Bn.) 20 Apr 1918 17 Son of Owen and Ann Jones, of 32, Peel Street, Abergele. Tyne Cot Memorial, West-Vlaanderen, Belgium. (1st Regt.) 20 Mar 1918 31 Son of Thomas & Eliza Jones, of 'Bodlondeb', Rhydyfoel, Abergele. Employed at the Globe & Phoenix Mine, Johannesburg, South Africa. Pozieres Memorial, Somme, France. (5th Bn.) 4 Aug 1916 32 Son of Peter Jones, of 7, New Street, Abergele. Jerusalem Memorial, Israel. 38722 & 35547 East Lancashire Regt. Royal Welsh Fusiliers 28 Jun 1918 19 Son of John & Margaret Elizabeth Jones, 19 New Street, Abergele. Aval Wood Military Cemetery, Vieux-Berquin, Nord, France. (13th Bn.) 4 Nov 1918 22 Son of Herbert Burleton Jones-Bateman, B.C.S., & Evelyn Jones-Bateman, of Eyarth, Ruthin, Denbighshire. Brother of Llewelyn Jones-Bateman (below). Also commemorated on the Llanfair War Memorial. Cross Roads Cemetery, Fontaine-Au-Bois, Nord, France. ("A" Bty. 103rd Bde.) 19 Mar 1916 27 Son of Herbert Burleton Jones-Bateman, of the Indian Civil Service, & Evelyn Jones-Bateman, of Pentre Mawr, Abergele, and of Eyarth, Ruthin. Brother of Francis Jones-Bateman (above). Also commemorated on the	Llanfair War Memorial. Lapugnoy Military Cemetery, Pa-de-Calais, France. 47813 Lancashire Fusiliers (1st Bn.) 15 Mar 1918 19 Son of George Joseph & Gertrude King, Gwrych Castle Lodge, Abergele. Tyne Cot Memorial, West-Vlaanderen, Belgium. (1st/5th Bn.) 27 May 1915 22 Born Hawarden, Flintshire. Son of Edward & Elizabeth A. Lewis, of 'Strathmore', St. George's Road, Abergele. Helles Memorial, Turkey. (1st Bn.) 25 Sep 1915 30 Born Bodfari, Flintshire. Son of Henry & Mary Elizabeth Lloyd, of 'Rhianws', 2, Granville Terrace, Abergele. Loos Memorial, Pas de Calais, France. (6th Bn. attd. 1st Bn.) 17 Feb 1917 21 Son of Margaret Mason, of Brooklands, Abergele, & the late William Tate Mason. M.A.. Regina Trench Cemetery, Grandcourt, Somme, France. (2nd Bn.) 23 Aug 1914 36 Son of Col. John Edwin Mellor, C.B., of Tan-y-Bryn, Abergele; husband of Kathleen Geraldine Helen Mellor, of 'Avonwood', Avonmore Avenue... St. Symphorien Military Cemetery, Hainaut, Belgium. (22nd Bn.) 18 Jan 1917 38 Born Abergele. Son of John & Sarah A. Needham, of 410, Edge Lane, Liverpool, England. Etaples Military Cemetery, Pas de Calais, France. (15th Bn.) 20 Oct 1918 Born Abergele. Bissegem Communal Cemetery, West-Vlaanderen, Belgium. (9th Bn.) 7 Jul 1916 38 Son of Charles & Betsy Pierson, of Newholme, Rodmarton, Cirencester, Gloucestershire, England; husband of Edith Alice Pierson, of Brig-y-Dou, Abergele. Thiepval Memorial, Somme, France. (1st Bn.) 14 May 1917 19 Son of David & Harriet Powell, 1, Peel Street, Abergele. Arras Memorial, Pas de Calais, France. 131900 Royal Garrison Artillery 20 Sep 1917 34 Son of the late Charles & Mary Pownall, of Marshfield Villa, Abergele; husband of Mary Pownall, of 2, Glanrafon Terrace, Tanygrisiau, Merionethshire. The Huts Cemetery, Ieper, West-Vlaanderen, Belgium. (15th Bn.) 31 Jul 1917 22 Only son of David Clark Radcliffe & Florence Mary Radcliffe, of 'Pen Dyffryn', Meliden, Flintshire. Artillery Wood Cemetery, West-Vlaanderen, Belgium. (14th Bn.) 6 Jul 1916 35 Son of Hugh Robert Roberts, of Bryn y Gasag, Pantasaph, Holywell, Flints; husband of Eleanor Roberts. Also named on the Gorsedd War Memorial. Thiepval Memorial, Somme, France. Denbighshire Yeomanry 5 Oct 1917 Born Abergele. Tyne Cot Memorial, West-Vlaanderen, Belgium. (1st Bn.) 21 Oct 1914 Son of Mr. and Mary Roberts, Manchester Cottages, Towyn, Abergele. Also named on the Towyn War Memorial. Ploegstreert Memorial, Hainaut, Belgium. ("C" Coy. 2nd Bn.) 15 Oct 1918 20 Son of Owen and Harriet Roberts, of 3, Tyddyn Isa Cottages, Towyn, Abergele, Denbighshire. Also named on the Towyn (Conway) War Memorial. Dadizeele New British Cemetery, West-Vlaanderen, Belgium. (14th Bn.) 18 Sep 1918 28 Son of Mr & Mrs William Roberts, of Bod-Gwilym, Abergele; husband of Jenny Dyrnogwen Roberts, of 19, Langdale Road., Victoria Park, Manchester, England. Gouzeaucourt New British Cemetery, Nord, France. 4531 19th Bn. Australian Infantry, A.I.F. 14 Jun 1916 22 Son of Ernest Lloyd and Edith Stacey, Dolobran, Pwll Coch Road, Abergele. Plymouth (Weston Mill) Cemetery, Devon. Royal Welsh Fusiliers 10 Oct 1918 56 Husband of Mary Ann Ellen Sutton, 11, Mount Pleasant, Abergele. Died at sea. Hollybrook Memorial, Southampton, Hampshire, England. (17th Bn.) 30 Jul 1916 20 Born Liverpool, England. Son of Arthur & the late Theresa Unsworth, 'Garswood', Abergele. Guillemont Road Cemetery, Guillemont, Somme, France. (5th Bn.) 10 Aug 1915 25 Born Llanrwst, Denbighshire. Son of Lewis & Eliza Jane Vaughan, of 3, Peel Street, Abergele. Helles Memorial, Turkey. (13th Bn.) 10 Jul 1916 21 Son of Edward & Alice E Williams, of Moranwedd, Abergele. Thiepval Memorial, Somme, France. (5th Bn.) 10 Aug 1915 21 Born Wrexham, Denbighshire. Son of William & Mary Williams, of 14, Bryntirion Terrace, Abergele. Helles Memorial, Turkey. (1st/4th Bn.) 27 May 1918 18 Son of William & Mary Williams, of 14, Bryntirion, Abergele. Soissons Memorial, Aisne, France. (4th Bn.) 5 Jan 1918 25 Son of Benjamin Jackson Williams & Annie Williams, of Morvan, Pensarn, Abergele. Lahana Military Cemetery, Greece. Son of Thomas Williams, 5 Pontydd, Towyn (also commemorated on the Rhyl and Towyn War Memorials). Thiepval Memorial, Somme, France. (10th Bn.) 20 Jul 1916 21 Son of Richard & E Mary Williams, of 7, Bryn Tirion Terrace, Abergele. Delville Wood Cemetery, Longueval, Somme, France. (2nd/5th Bn.) 3 Apr 1917 19 Son of Edwin & Jane Williams, of 4, Vale View Terrace, Abergele. Cambrin Military Cemetery, Pas de Calais, France. 131633 Royal Field Artillery (9th Div. Ammunition Col.) 15 Dec 1918 20 Son of Arthur and Betsy Wardle Winkup, of Ty Croes, Foryd, Abergele, Denbighshire. Native of Prestwick, Manchester. Also named on the Towyn War Memorial Mons/Bergen Communal Cemetery, Hainaut, Belgium. (8th Bn.) 26 Mar 1945 21 Born Abergele. Reichswald Forest War Cemetery, Nordrhein-Westfalen, Germany. 77 The Duke of Lancaster's Own Yeomanry Medium Regt. Died 18 July 1944 32 Son of Hubert & Elise Dimbleby; husband of Olwen Vaughan Dimbleby, of Abergele. Bayeux War Cemetery, Calvados, France. (6th Bn.) 26 Mar 1944 29 Son of Mrs . Ellis, of Abergele; husband of Selina Ellis, of Abergele. Taukkyan War Cemetery, Burma. 4208460 Royal Army Medical Corps 9 Jan 1946 St. Michael's Churchyard, Abergele. (15 Bty., 6 H.A.A. Regt.) 18 Sep 1944 29 Son of Mrs A Halliday, of Abergele. Singapore Memorial, Singapore. 974571 Royal Air Force 25 Sep 1941 Calvinistic Methodist Chapelyard, Abergele. (50 Sqdn.) 14 Jan 1942 31 Son of Squire & Louise Jacob, of Abergele. Runnymede Memorial, Surrey, England. (2nd Bn.) 31 Jul 1940 32 Son of John Arthur & Elizabeth Jones, of Abergele. St. Michael's Churchyard, Abergele. C/SS 27314 Royal Navy H.M.S. Stronghold 2 Mar 1942 25 Son of Thomas H. and Margaret Jones, of Abergele, Denbighshire. Chatham Naval Memorial, Kent. (6th Bn.) 24 Feb 1945 32 Son of Frederick & Ellen Jones, of Abergele. Reichswald Forest War Cemetery, Nordrhein-Westfalen, Germany. 4197501 Royal Fusiliers City of London Regiment (9th Bn.) 18 Feb 1944 25 Son of Annie Lewis, of Abergele. Cassino War Cemetery, Italy. 994134 Royal Air Force Volunteer Reserve (57 Sqdn.) 12 Aug 1942 24 Son of the Rev. Richard Vaughan Owen, & Maggie Elizabeth Owen, of Port Dinorwig, Caernarfonshire Nes General Cemetery, Ameland, Waddeneilanden, Friesland, Netherlands. H.M.S. Karanja 12 Nov 1942 18 Son of John & Edith Parry, of Abergele. Sunk by German aircraft off Bougie, Algeria. Plymouth Naval Memorial, Devon, England. (103 Sqdn.) 26 Nov 1943 29 Son of Hugh David & Gwladys Cordelia Pugh; husband of Gwyneth Myfanwy Pugh, of Abergele. Berlin 1939-1945 War Cemetery, Berlin, Germany. H.M.S. Royal Oak 14 Oct 1939 21 Son of Charles & Florence M L Shaw, of Abergele. Torpedoed and sunk by the German submarine U-47 while anchored at Scapa Flow, Orkney, Scotland. Portsmouth Naval Memorial, Hampshire, England. (6th Bn.) 12 Aug 1944 30 Son of Ernest & Louisa Wells, of Abergele. St. Manvieu War Cemetery, Cheux, Calvados, France. North Staffordshire Regiment 21 Mar 1942 Born Swadlincote, Derbyshire, England. Son of Edwin & Eliza Wetton, Hope and Anchor, Newhall, Burton-on-Trent, Staffordshire, England. Husband of Mary Wetton (nee Roberts). Died at Vale of Clwyd Sanatorium, Llanbedr, Denbighshire. Abergele Cemetery.